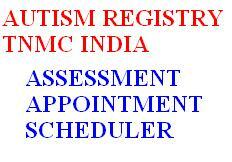 Use this site for provisionally booking automated appointment for "Autism Evaluation Pediatric" at Nair Hospital Mumbai. Click here to see the appointment list. you may be given sms confirmation. You may need to provide/register your name email address to book the appointment. At out center pediatric autism assessment is done by a single person, so please book your appointments on Tuesday/Friday between 10 am to 11 am only. Please avoid public holidays. Bookings are full till may 31, 2014. Consultation /assessment will take place at OPD 9, first floor OPD building. Ask for Dr Alpana Somale or her assistant. After assessment , a multispeciality meeting decides the further plan of certification and action. you may need to get 2 copies of assessment form which may be provided to you at this site or at time of consultation.